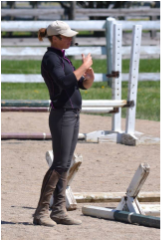 Amanda is available for private and group lessons at Fairwind Stables. Students range from just starting out through Training Level eventing. She has over 15 years of experience and follows a patient, basics-building approach to teaching. We don't currently have any lesson horses of our own so students need to trailer their own horses to Fairwind Stables. Occassionally, lessons can be taught off-farm as time allows. 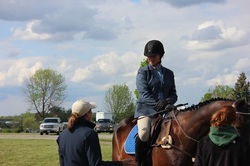 Students who wish to compete can be coached at events or schooling shows. Amanda is available to meet students at many of the Area VIII events and DLSC hunter and dressage shows. Cost varies depending on many students are competing and how much coaching the student needs. Some students prefer just to do course walks with Amanda or warm-up for a specific phase and some prefer to have coaching for everything. Please contact Amanda if you would like help at a competition.